If you walked into our office a year ago you’d have found our Pantone wall right at the entrance. Krishna and Kamini had put it up, card by card, at the inception of PSHQ in 2016, along with Team A&J who shared the office space with us back in the day. Then again, if you were here 6 months ago, you’d see a vibrant tropical wall mural. Pink hibiscus peeping out from behind lush green leaves, hand painted by artists from our very own Artifold. Now here we are, not too far into 2019, with our Dusty Pink Board and Batten Wall. Quite evidently we love change, and what’s wrong with that?! You might wonder how we arrived at this sophisticated feature wall from our quixotic garden mural. We’ve always loved the Classical British Style of Interiors and wall moulding is an intrinsic feature of this style that offers endless possibilities in decorating a wall. Although it had a functional origin, over the centuries it’s journeyed from its ornate past to the simpler designs we see today. We narrowed down on the Board and Batten design which perfectly fits into a contemporary set up and works well with our aesthetic. We were ready to begin our newest little project. The mural was scraped off and the wall prepped for its brand-new cladding. The placement of battens involved a fair bit of math. We sampled a few squares to see what worked best visually. While the boards and battens were up on the wall in the blink of an eye, choosing between Summer Pink and Desert Rose wasn’t as easy as we’d imagined. We finally managed to select one and the wall was ‘duco-ed’. Turns out, we were nowhere near done with our fascination for the tropical! It made its way back into the artwork and looks so much the better for it. With the redesigned accent wall our office looks absolutely groovy. Wall moulding is the go-to design detail for classical addicts. It is so versatile that it can make a space look modern and minimal or even vintage and grand. These designs have come alive in a contemporary form at a law office we recently designed. The mouldings are painted in a stately grey and neutral white, and reflects the power and tension involved in their profession. It’s a feature that we have used consciously on wall panels, cabinet shutters and doors with a view to tie the whole space together holistically. Contrary to the austerity we’ve orchestrated here, the wall decor taking shape in our upcoming classical villa is all splendour and extravagance. But no matter the style, we always get stunning results. Needless to say, we’re gonna be using it a lot! Because we know this is a trend that’s here to stay. Here at PureSpaces we are very enthusiastic about doing up spaces; it would have been weird if we weren’t, right? Needless to say we love some change at PSHQ too, every now and then. We’re always on the lookout for all things within the studio that we can restyle. So in December last year we came across an extra writing board and decided to put it to some use. We pooled in ideas and picked a Pocket Resolution Display to put up on the board. Next, we got a pack of neon coloured craft paper and set to work with our scissors and paper cutters. A couple of hours of cutting, pasting and fun banter is all it took to get our resolutions neatly tucked away in the neon envelopes. And there it was - a vibrant grid of fluorescent pockets, created at practically no cost. This was not just a cheerful addition to the space, but they were relentless reminders of our goals. So now you know our secret to remain sticklers for resolutions! But that’s not all that came off our little DIY adventure. It was a fun, team-bonding activity and ever since, we've been on a roll! Over the last 3 months, we found a few great DIY ideas to play around with. We started off with some interesting signage for our space. We picked out a bunch of things for less than a grand from Itsy Bitsy, a stationery wonderland we often haunt. The letters got a couple of coats of paint in PureSpaces’ favourite shade and were stuck onto the doors with Permanent Adhesive Minis. And voila! Having successfully completed 2 DIY Projects we were ready for our third. This one was art-centric as compared to the previous ones that were mostly functional. 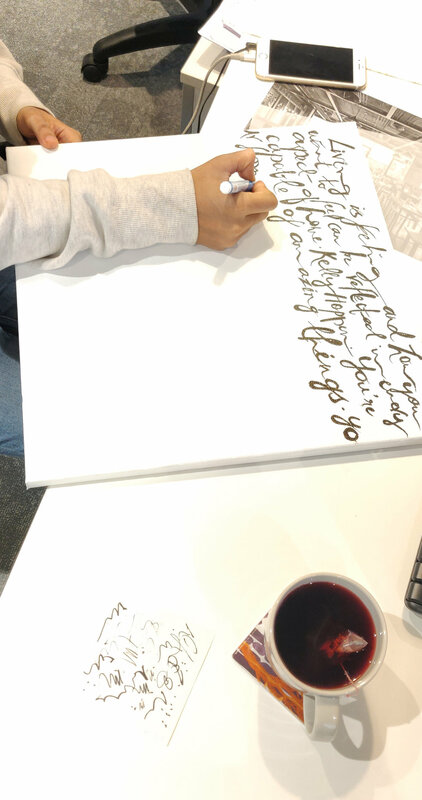 We can’t emphasise enough on the fact that this activity was absolutely therapeutic. ‘I never met a colour I didn’t like’ - Dale Chihuly, is an interesting quote that we stand by as interior designers. 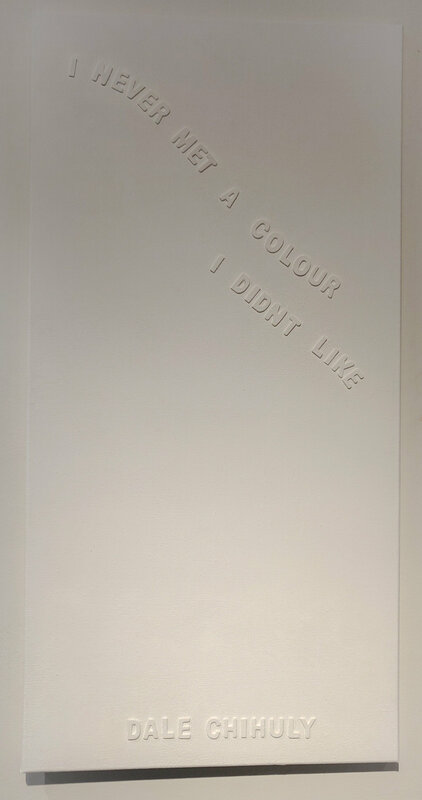 Ironically the artwork is a composition of these words painted white on a white canvas, creating an embossed effect. As minimal as this is, the second one has a zillion ideas haphazardly crammed on a smaller canvas.These “works of art” made it to the walls to compliment the existing black and white posters. Well, we’re definitely big fans of DIY. It’s inexpensive, useful and a whole lot of fun. It’s how we unwind at PSHQ and we totally recommend it! We’ve been gone a while now, but the New Year has brought in brand new resolutions and we’re back, with P.S. blog season 2! We hope to keep up the buzz with all the latest news, just as Kamini did. Longchamp’s Nylon Shopper – Now, here’s a fashionable travel bag you can trust, that magically fits everything. We’ve got it in five colours! Laptop – We may be out of the office, but we sure have a lot to do. 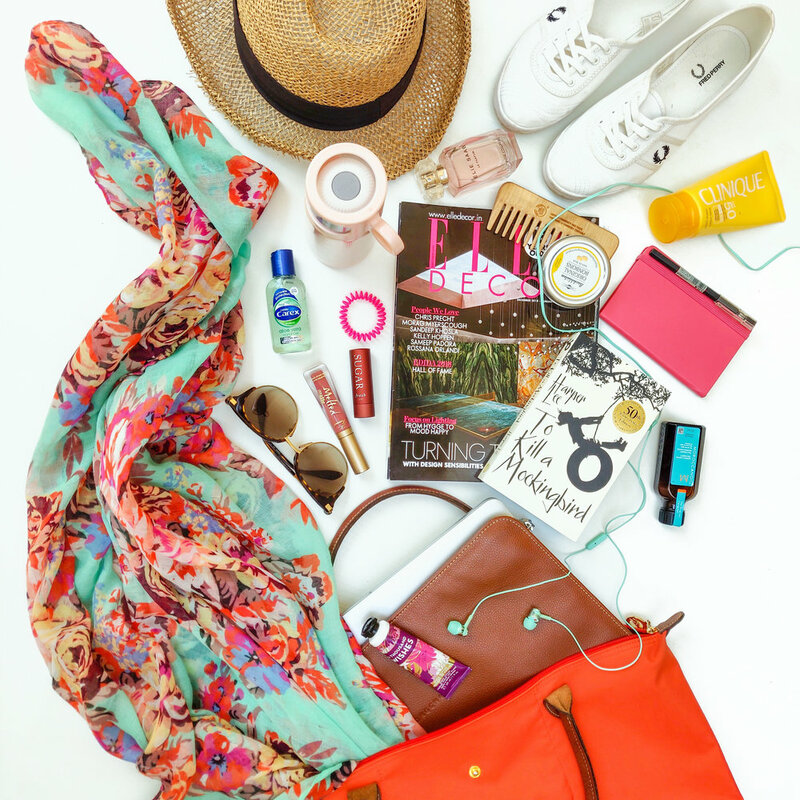 Scarf – For the cold flights, and to add colour to our lives. Sanitiser – Gotta keep them hands clean. Invisibobble Hair Ring – Doesn’t leave a kink in your hair, for all the times we resort to a top knot. Sugar Lip Balm – Undoubtedly, the best in the biz. TOO Faced Melted Matte Lipstick – It’s all in the lips, when we’re going makeup free(ish). A Design Magazine – Catching up on the latest trends on-the-go. A Book - ‘Cause you need it while sunbathing. Earphones – Taking-off into La La land. Muji Pen – A stationery staple for us designers. Moroccan Oil – To keep the frizz at bay and stay away from bad hair days. Perfume – You’re never fully dressed without fragrance. Hand Cream – Absolutely crucial after all that sanitising. Thermos – Hot Water > Cold Water any day, to keep the waist in check. Bachblüten – To beat the blues. So, it turns out we do need a lot of things. But a girl needs what she needs. Honestly, we can’t wait for our next getaway! So, while some of us are casually in Russia for the week (wtv Krishna), the rest of us are throwing back to last summer in Italy. It’s been a while, people of the internet, but finally, we are back with our favourite PS Travel Diaries series! This trip, we covered Tuscany and the Italian Riviera. 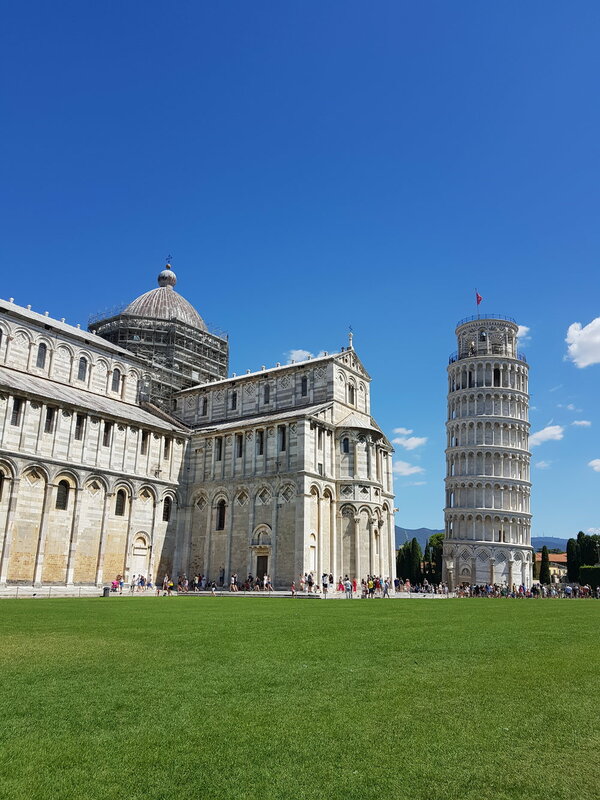 Starting with Pisa, this town is mostly all about the photo opp. The 18 quid to get up the leaning tower is definitely not worth it but since it’s the arrival destination for most cheap international flights, when in (or close-ish to) Rome right? Florence is a magical town filled with parks, views and secret midnight bakeries (yes you read that right). The Duomo is an architectural marvel for all the nerds out there and unlike the wonky tower of Pisa, the view is definitely worth all those steps. For all the art lovers out there, Uffizzi is free on the last Sunday of every month. If you’re overwhelmed by all the culture, laze about at Le Cascine Park and for a bit of shopping, check out Florence The Mall, an outlet with ridiculous deals on Prada, Gucci, and other designers. 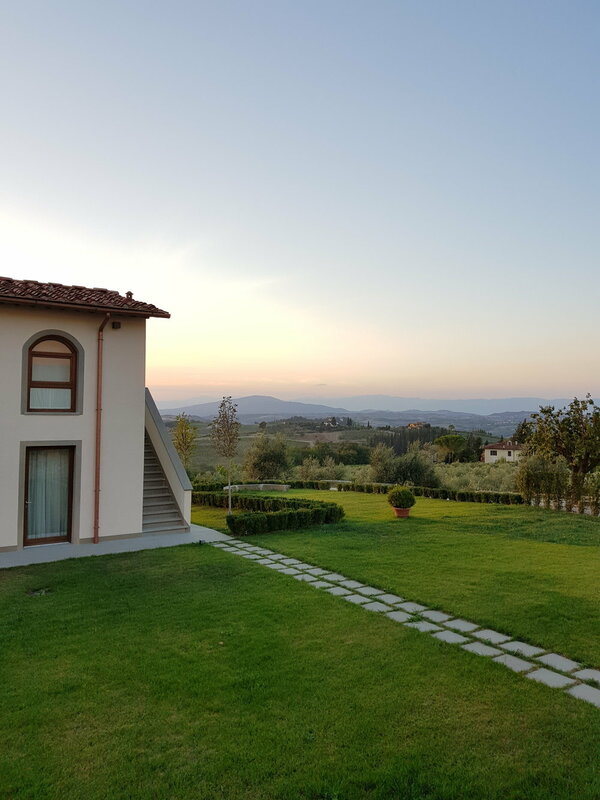 From there, we headed straight to Villa Le Calvane, an estate that sits in the heart of Tuscany. Only 20K from Florence, the drive through the rolling hills and vineyards is unbelievable. This place has got quite the history, it has been the home of renowned painting, “Madonna and Child” by Benivieni and in 1942, works of Botticelli and Michelangelo were hidden there during the war. German troops even used a circular Ghirlandaio as a dining table when they passed through. History aside, our main reason for visiting was for the Merlot and Cabernet (obvs). 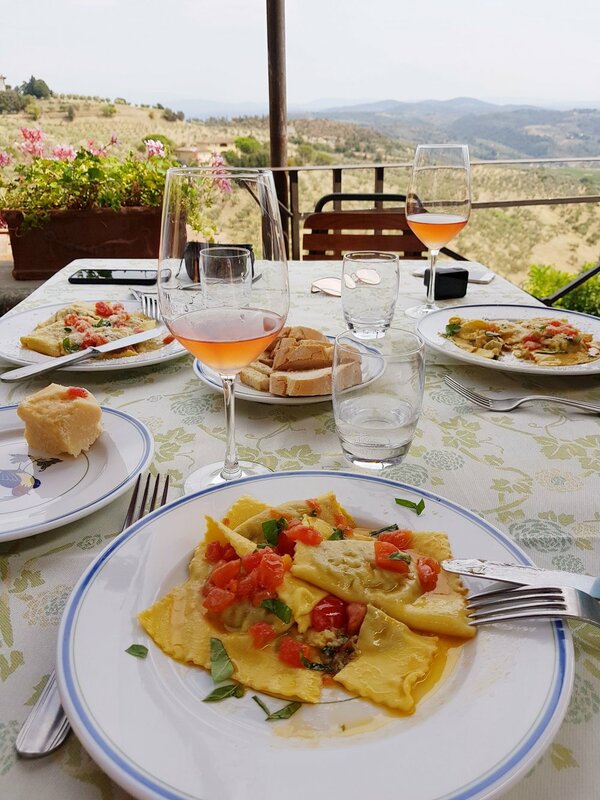 When we weren't drinking, we ate at Ristorante Da Delfina and La Cantinetta Di Passignano. Cinque Terre, the five islands on the Italian Riviera, have to be on your bucket list. We especially recommend Manarola and Monterosso (the later is actually two towns in one). It’s right on the cliffs beside the ocean, so everywhere you go is a workout but if you are into hiking and swimming, then this is the perfect vacation spot for you. Italy has so much to offer and there’s only so much you can do at a time, if you’re not OD’ing on gelato then really, have you ever been? It’s been a tough year and yoga has been our saviour! We thought we would talk about some of the things that gets us through the day and yoga is definitely one of them. Most of you know of this ancient Indian practice - the controlling of the body and mind through meditation and exercise. This stress buster is the key ingredient to our zen work life. If only we could attain moksha! Mumbai based Zia Yoga was our go to instructor but there are plenty of classes in the city (Akshar Yoga is walking distance from the office). Do a little research an decide what school of yoga works best for you. Krishna’s routine is a more general fitness based approach. She usually starts in the morning and she spends an hour, three times a week doing a variation of surya namaskars and a combination of cardio, breathing and stretches. Remember when it comes to yoga 7-1=0 so you should dedicate at least 5 minutes every single day to it, it’s a way of life after all. As far as accessories go, we recycle our regular gym clothes and equipment (mat, foam roller, elastic resistance bands, headbands and clothes) but we know that Fabindia has a special yoga wear section and if you’re looking for high end, specialised leisure wear, Proyog is another brand to look out for. While yoga has recently been used as a political tool to promote nationalism, we encourage everyone to counter that saffron tinted nonsense and get into the spirit of it regardless of your background. Namaste from the folks at PS!